Let me share my experiences in my garden while growing fruits like mandarin, blue berry, strawberry, guava, lime, papaya and mango; vegetables including cucumbers (growing cucumbers), chili, tomatoes (growing tomatoes), capsicums, bottle gourd, zucchini and eggplant growing eggplants); herbs like mint, dill, coriander, ginger (growing ginger), garlic (growing garlic), rosemary, lavender and fenugreek; and various flowers. My interest in gardening is from my childhood when I was as young as 5 years old. We lived in a three storey old style stone house and we didn't have any space for even a small garden. My father had planted several plants in pots at the terrace of the house. Those were the days when we did not use to get water daily in the taps and there was not enough pressure to reach the water on the third floor. We used to carry water in buckets to water the plants. When I grew young, I was living in a house which was surrounded by fruit trees like lychees, mangoes (Growing mango tree), plums, grapefruits, guavas (growing guavas in pot) and jackfruit (kathal) and many Eucalyptus and Kachnar (Bauhinia variegata) trees. I also had a small kitchen garden where my interest in gardening matured. I grew the sweetest papaya trees there and also many seasonal vegetables such as okra (Bhindi) (growing okra from seeds), radish, onion, potatoes, bottle gourd (how to grow bottle gourd) and zucchini besides coriander, ginger, garlic and mint (planting and growing mint). After I moved overseas, I continued my interest in gardening. Here as I have more free time, I give maximum time to my plants. However, I don't have too much garden bed space, so I continue growing in pots and containers. I reserve bed space in the backyard for growing seasonal vegetables. Over the years, I have developed my garden in more than 200 pots and containers to brighten every corner of my front yard from spring to fall. The pots are not necessarily bought from garden shops making my hobby too expensive. Gardening need not to be expensive. So I use all sorts of things from old containers, packing boxes, drugs, empty oil tins, unused wheelbarrow, old tyres and Styrofoam fruit boxes. On a council clean up day if you see your neighbors putting out rubbish, take a closer look. There may be beautiful containers lying there, junk for them but a garden gold for you. I have propagated many plants from stem cuttings, root division and layering. Whenever I go on walking and if I see a new plant on the fencing of a house, I take its cutting and come immediately to my house to plant it. 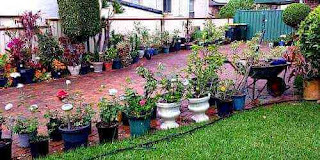 Like this I have grown several plants including azalea (propagation of azaleas), hibiscus, roses (propagation of roses from cuttings), mandevilla, hydrangeas (hydrangeas propagation), Arabian jasmine (Mogra Jasmine propagation), begonia and geranium, besides blueberries (Blueberry propagation). I shall be sharing my experiences in future posts.